Work on the 1.6 km Rani Jhansi grade separator (road engineering jargon for a structure that allows traffic from different directions to flow without obstruction) began more than 19 years ago. To this day, it remains incomplete. Some concrete piers stand forlorn, some support bald bridge decks strewn with the detritus of urban decay: cigarette and bidi butts, garbage, mounds of building rubble. Children from houses that were demolished to make way for the structure play games on the decks. Or fly kites. Below them, on St Stephen’s Hospital Road, the chaos of Delhi plays out: stuffed share-a-ride autos, e-rickshaws, mini-buses and wide-bodied DTC buses, cars and two-wheelers argue, sneak or intimidate their way past each other and scores of pedestrians and vendors, gaggles of construction workers, carpenters, plumbers and sanitation workers. The scene makes for a grim symbol: for a city that aspires to fly high as the kites, the reality is depressing. A multi-level parking facility in the Model Town area, under the North Delhi municipal corporation, built at a cost of Rs 225 crore and with a capacity of 110 cars, lies disused. The point of entry is too narrow for vehicles. A similar Rs 30 crore project of the South Delhi municipal corporation in Hauz Khas has failed, again because of faulty design: few use it as the exit is too narrow for large cars. 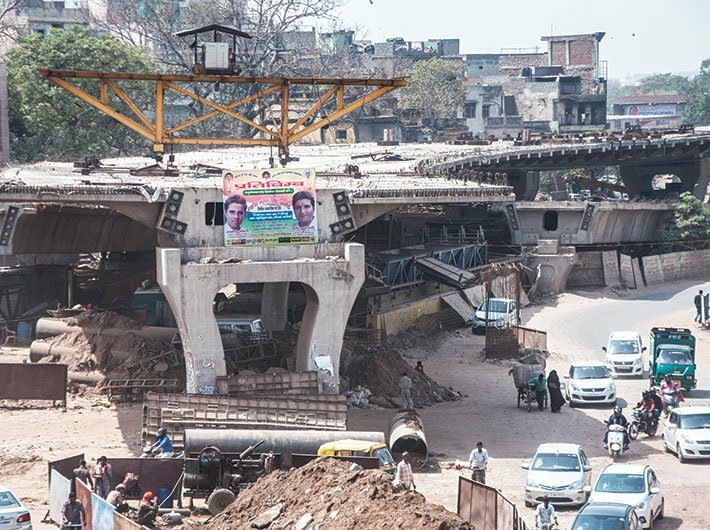 The Rs 209 crore Bijwasan road project – which includes a Najafgarh-Bijwasan road, railway overbridges at Bijwasan and Sultanpuri, remodelling and covering of the drains in Madipur and Ramesh Nagar – remains incomplete five years past the 2012 deadline. A consultant hired earlier for the Rs 52 crore project involving just the road turned out to have wangled the construction contract. This being unlawful, work was halted. Owing to shortage of funds, the North and East Delhi municipal corporations were unable to pay the salaries of their safai karmacharis for months, leading to a strike in 2015, raising a stink in those parts. 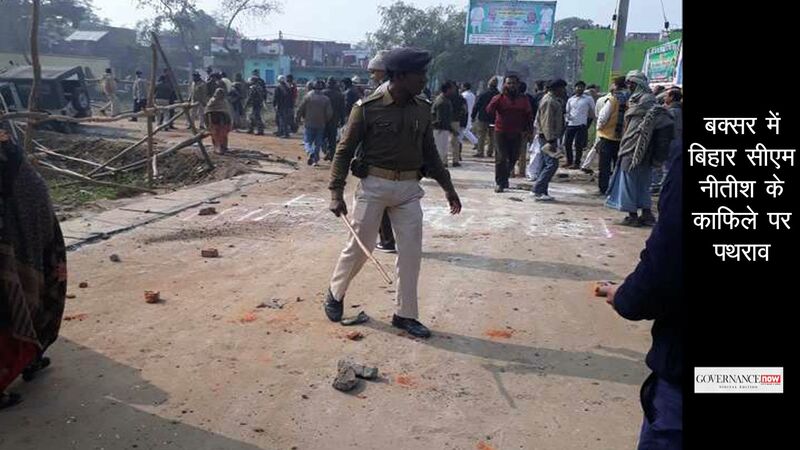 The Mahila Haat and the Kishanganj railway overbridge are in limbo. Of the Bijwasan project, Congress councillor Parvesh Rana says, “The construction site has grass all over it since work has not been done in the last so many years.” And Mukesh Goel, leader of the opposition in the Municipal Corporation of Delhi (MCD), says, “It shows the incompetence of the BJP-led municipal corporation, which has failed to carry out these costly projects. There are so many projects where the municipal corporation spends money but is unable to generate any sort of revenue. It has come to such a pass that the workers have to protest to get its salaries.” Indeed, the BJP has been in power for 10 years in the MCD, and must therefore share part of the blame. But the root cause, according to many (especially those in the BJP), is the trifurcation of the MCD in 2012, when Sheila Dikshit was chief minister of Delhi. Then, as now, the MCD was with the BJP; and at that time, the state government was with the Congress. BJP leaders do not shy from accusing her of embarrassing the BJP and spoiling its prospects by dividing up the MCD into one each for the northern, eastern and southern regions of the city. At that time, it was decided that the Delhi government take up the responsibility of looking after the finances of the municipal corporations, providing funds till they are able to sustain themselves. That was not to be. The result, they say, was an insurmountable funds crunch. After the 2015-16 budget of the East Delhi municipal corporation (EDMC), municipal commissioner Manish Gupta remarked at their dingy Patparganj headquarters, “We will never be able to bridge the gap between our income and expenditure in the EDMC, no matter what we do.” Quite a drastic statement for a bureaucrat to make over a buffet lunch, after proposing a minor hike in property tax as a meagre attempt to improve finances. Salary expenses alone tripled with trifurcation. Consider the higher ranks alone: the MCD had one commissioner, six additional commissioners; while after trifurcation, there are three commissioners, 12 additional commissioners, three municipal secretaries and a multiplication of posts such as assistant commissioners, revenue collectors, departmental heads and so on. The increase in the number of senior posts led to vacancies at lower levels. The corporations filled these with inter-departmental transfers, giving staff 20 percent hikes and promotions. On the political side, there are three mayors, three leaders of the house, three leaders of the opposition, a chairperson for each of the 27 committees, and an increase in the number of councillors too. Of course, many of these post-holders had to be provided with cars. Then there are house meetings, standing committee meetings, ward meetings and meetings of officials, all of which involve administrative expenses. 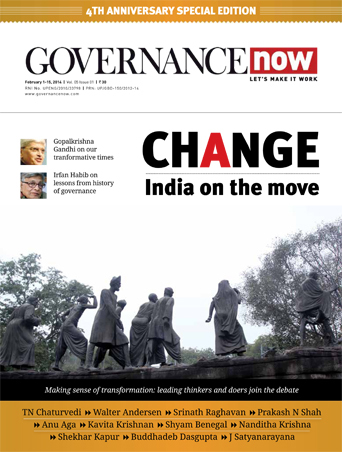 New websites had to be created too: according to a reply to an RTI application, the monthly expense for maintaining an e-governance project is Rs 1 crore per month, and the three municipal corporations together spend Rs 65 crore on their websites. Many bureaucrats, including one who was closely involved in the process, say trifurcation was aimed at getting political mileage. Delhi’s former chief secretary Rakesh Mehta calls it a political decision, but wonders if a reunification would make things better. “The question arises: what is the guarantee of improvement of financial health if the three municipal corporations are unified?” he says. Such indeed is the mess. Ahead of 2017 municipal elections, the three civic bodies do not have money to pay their employees. The internal revenue of the three corporations is Rs 5,975 crore, while the expenditure is as high as Rs 6,240 crore, including the salaries of employees, arrears to be paid, medical allowance etc. The three corporations face an extra burden of Rs 2,000 crore in the implementation of the Seventh Pay Commission recommendations. A break-up reveals a detailed picture. The North Delhi municipal corporation has an internal revenue of Rs 2,375 crore against a salary expenditure of Rs 2,640 crore, leaving a gap of Rs 265 crore. The South Delhi municipal corporation has estimated earnings of Rs 2,755 crore against expenses of Rs 2,640 crore, making it the only corporation that’s not in the red. The shortfall for the East Delhi municipal corporation is Rs 95 crore. The three agencies spend Rs 2,476 crore on education, Rs 2,628 crore on sanitation and Rs 1,252 crore on health – Rs 6,356 crore in all under three heads. The budget estimate for the three municipal corporations is Rs 14,300 crore, of which Rs 6,240 crore goes into salaries and the rest is to be spent on sanitation, education and health sectors. “For the North Delhi municipal corporation, the revenue collection against its estimates has been decreasing by the year. In 2012-13, the corporations collected Rs 2,924 crore, which is Rs 547 crore more than this year’s collection of Rs 2,376 crore as internal revenue. We have never seen this state of affairs in municipal corporations before. We didn’t have to face this during previous governments and the president’s rule. The deficit is going higher and higher, we have not received municipal reforms funds from the Delhi government as we could not achieve the fiscal target. As per rules, it’s given only if the corporation improves finances,” says Mukesh Goel, leader of the opposition in the North Delhi municipal corporation. Revenue from house tax, parking fees, advertisement, conversion charges, building plan sanctions etc do not come in regularly, leading to delay in payment of salaries and other expenses. Some 40 percent of the posts are vacant, and a majority of employees are on contract (and therefore paid less than what their permanent counterparts would get). The situation has deteriorated to such an extent that the corporations are not able to continue their primary responsibilities like sanitation, health and primary education. Moreover, senior officials in North Delhi municipal corporation say not a single penny has been spent out of discretionary funds by senior functionaries like the mayor, the chairman of the standing committee and the chairpersons of different special committees for education, sanitation, gardens and so on. “Unless the corporation is unified in the most systematic way, we cannot ensure proper delivery of services. The MCDs have gone horribly wrong in managing their finances,” says an official. For the BJP, which seeks to avenge its humiliating defeat in 2015 assembly elections but at the same time faces strong anti-incumbency in the civic bodies, prospects depend largely on the good governance and zero tolerance to corruption planks espoused by Modi. This is why the party denied tickets to all sitting councillors and fielded new faces. “It’s a cleanliness drive. We are committed to provide corruption-free leadership. The new faces are aimed at infusing new energy and preparing a second line of political leadership in the Delhi BJP,” says Delhi BJP president Manoj Tiwari. The Bhojpuri-star-turned-politician exuded confidence that this would stem anti-incumbency. In the BJP’s stupendous Uttar Pradesh performance, Tiwari played a key role in the eastern region known as poorvanchal, and the party hopes he will wield similar influence with migrants from those parts in the municipal elections. This is a dominant group: 40 percent of the migrants in Delhi are from that region. Another plank the BJP banks on is the “non-performance” of the AAP government and a series of corruption charges against its ministers, right from the involvement of its MLAs in criminal matters to the fake degree row to overspending on advertisements, misappropriation of funds and illegitimate hiring of contractual employees. The party is also trying to corner the AAP government over broken poll promises like opening new schools and colleges, installing CCTV cameras and so on. The Congress, too, banks on anti-AAP votes and hopes to regain lost ground in slums and unauthorised colonies, traditional vote banks of the grand old party. Ajay Maken, an old hand, is in charge, and Capt Amarinder Singh, who single-handedly took on the AAP chief Kejriwal and made him bite the dust in the Punjab elections, has been roped in too. The party is encouraged by last year’s byelections, in which it bagged five out of 13 municipal wards. The forthcoming elections also mark the entry of Swaraj India, a breakaway from the AAP, and JD(U). The JD(U) promises to legalise all unauthorised colonies and address issues like unemployment, power supply, water supply, drainage and also seeks votes in the name of the liquor ban in Bihar, while Swaraj India is banking on solving environmental issues, recategorising colonies and recovering tax dues from the Delhi Development Authority. Banwari Lal, 43, lone breadwinner of his family, was found dead near a railway crossing in Sarita Vihar two years ago. An SDMC sanitation worker, who had not been paid his salary for five months, Lal killed himself. “We were under huge debt. We didn’t know how to feed our children, we didn’t know how to pay for their school fees. He would go to work and return, yet did not know when the salary would come,” says Lata, his bereaved wife, who lives in their house in a slum colony in Madanpur Khadar. Lal had considered himself lucky when his job was made permanent by the SDMC in February 2014. But then, salaries would be infrequent. “It became a tough task for him to manage a family of six. He was the sole breadwinner of the family. When his service was regularised, he was not given his arrears for five months. We were struggling to make ends meet. There was no money for basic survival, so he had to take a loan which he couldn’t pay back till date,” she says. Lata blames the BJP-run corporation for her husband’s suicide and won’t vote for the BJP. “The karmacharis are in deep financial crisis. There are so many of us who were forced to take loans as MCD had not paid for months. The Kejriwal government had promised us due payment of salaries but everything went down the drain,” says Rajendra Mewati, general secretary of the United Front of MCD Employees which is considered close to the Congress. The politics of garbage has come full circle now. The deadlock between the Kejriwal government and the municipal corporations over disbursement of funds has brought civic services to a grinding halt over and over again. Nearly 1.5 lakh employees, including 57,000 disgruntled sanitation workers, doctors and teachers repeatedly went on strike last year demanding payment of salaries and arrears. And the incumbent BJP seems caught, because these employees may well favour the Congress or AAP with their votes. In any case, MCD workers are an exploited lot. Their regularisation and payment of arrears is always slow. Quite often, the corporations flout the rule that any contractual employee with 240 days’ attendance per year for three years has to be considered a permanent employee. To top it all, sanitation workers are exposed to disease from garbage collection and danger from toxic gases when they descend to clean sewers. Delhi’s municipal corporations have been described as dens of corruption. From low collections of parking charges to property tax, many of their ills are being blamed on corruption. According to one report, the three corporations have some 22,000 ghost employees. Some feuds over corruption have spilled out in the open: the mayor and the leader of the house in the North Delhi municipal corporation, for instance, traded corruption charges over renewal of garbage-lifting contracts. But at the same time, the corporations spend over Rs 20 crore per month paying ghost employees. Clearly this cannot happen without the connivance or involvement of officials. Parties opposed to the BJP are trying to play up this angle. Recently, Kejriwal swore to spruce up Delhi and make it look like London if his party was voted to power in civic bodies. But that seems a tall order for a city that can now claim to be the political as well as financial capital of India. For even basic garbage management seems to be a major problem: Fires break out frequently at the overexploited landfills. From outsourcing garbage collection to private agencies to deploying new technologies, the three municipal corporations have tried everything in vain. Nearly 65,000 sanitation workers, 1,500 dhalaos, over 500 trucks and nearly 1,000 auto-tippers have failed. It can all be blamed on poor management. Delhi produces nearly 8,000 tonnes of municipal solid waste every day which is expected to go up to nearly 20,000 metric tonnes by 2021. However, all three landfills at Ghazipur, Okhla and Bhalaswa are full to capacity and the civic bodies are struggling to find alternative sites. Senior officials said they require at least 600 acres. The master plan for 2012 provides for 1,500 acres, but will it be realised? And when? These questions will hang over the city and its voters as they go to the polls in a week’s time.